Today, my sister is gone, she has journeyed far into the distant horizon – leaving - lingering in my nostalgic memory - questions that may forever remain unanswered - for the long pause we have had - of unspoken words between us - I now heavily regret". When I first met Chantal in the eighties, not only was I struck by her beauty and an enchanting smile that lit her face, I was drawn in by her strong character, by the determination and resilience she had in pursuing her gift and passion in film-making. I hold in my memory, the dream she had of being the best in what she did, the desire she had of having all the support she needed in sharing her gift of story telling and the wish she had in being able to achieve it. For all she wanted to be - was to be at her best performance - when working and producing stories that spoke to the values she held dear to her heart. We were young then, and that time the world was a beckoning, exciting adventure, we saw so much possibility, so much opportunity in making our world of cinema function - function in an effective way - in a way that gave us the courage - the passion - and the love to continue being the conscience keepers we had to be and wanted to be, the teachers we had to be and wanted to be, the learners we had to be and wanted to be, the robust and independent storytellers we had to be and wanted to be . Our hearts were young, full of life and full of verve – we were ready to conquer the world with this big wish list we had. Today, my sister is gone, she has journeyed far into the distant horizon – leaving - lingering in my nostalgic memory - questions that may forever remain unanswered - for the long pause we have had - of unspoken words between us - I now heavily regret. I would have loved to know whether her dreams of what she wanted to do had been met, whether the wealth of stories she wanted to tell, had been told. I would have loved to have her views on what she thinks of us now – and on where she thinks we could be or should be in this beloved world of cinema that so possessively entraps and captivates us. Chantal’s passing and that of others before her should not be in vain. The recent flooding of the library at the FESPACO took us by shock, the damage and loss that is incurred offers a powerful metaphor that evokes and invokes a greater consciousness of creating a future that is founded on pillars of prosperity - for procrastination is known to be opportunity’s natural assassin. We must aspire to that which necessitates measures that compel us toward creating tangible tools that help us create an infrastructure that is robust and responsive in managing African audiovisual cinema institutions. The continuing loss of Africa’s intellectuals, the continuing loss and devaluation of Africa’s intellectual property can not continue to pass as unfortunate incidents – unfortunate incidents that seem to leave us in despair – feeling helpless and disempowered. It is through the loss of our talent, the passing on of our most militant of our creative force that we must recharge our creative, intellectual energies, sharpen our creative weapons and compel change by looking at change with a different eye and an approach that compel us to be the change we want to see and be. We have lived in a scarcity state for far too long, where stories made with the vigilance and conscience of men and women such as Chantal remain obscure. Our mass audience have long been waiting and ready to receive stories and images that are really about us, images that truly are reflective of our spaces, experiences and thoughts. That was Chantal’s dream – to penetrate the minds of that audience. 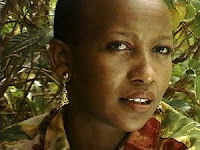 Is it not ironic that in the Southern parts of Africa and even elsewhere, very few film-makers, television viewers and cinema goers hardly know who Chantal Bagilishya is if we dared to ask – whereas we would know of those film-makers and actors that are not from our continent. Chantal was a cadre who walked and braved the treacherous rocky path we all are so accustomed to travelling. She played her part and went as far as she could – we need to run the relay race and make her smile in her new spiritual world where she joins other giants on whose shoulders we stand today. Wishing the family and friends, courage and strength – let today be a day that celebrates her life – a day that appreciates the gift she was to us all. 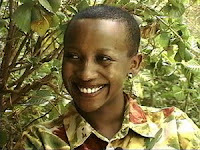 I have the sad news of the passing of Chantal Bagilishya, Paris-based Rwandan producer, in the early morning of 28 September. Let us give tribute to her, her work and her contribution to cinema. She will be dearly missed. I had the pleasure to talk with her on two occasions, at FESPACO in Ouagadougou, Burkina Faso in February 1997 and in Paris in August 1998, about her evolution into cinema, her vision of African cinema and her overall enthusiasm for the world of cinema. 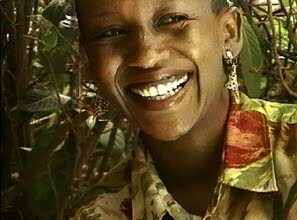 I am republishing excerpts of the interview as it appeared in my book, Sisters of the Screen: Women of Africa on Film, Video and Television, 2000. Chantal, could you talk about how you came into the world of cinema? What were your experiences as a young girl? Did the idea develop as early as your childhood? No one in my family has worked in this milieu. It was a dream like all other dreams. One never actually knows whether it will become a reality. As it turns out, my dream has become a reality and I am quite satisfied. I remember exactly when I became aware that I was attracted to the world of cinema. It was the first time I saw the cinematic image, I was just about ten years old. I was completely fascinated by this image...I was watching the TV for the first time. I thought to myself, "How is it possible? How can people actually be behind the television image?" Afterwards, I don't know how it happened exactly. I did not consciously decide to work in the area of cinema. I know that I was very fascinated with the people and later, thirty years later, here I am inside of this world. You entered having already met people in cinema? No, not at all. Since it was an area in which I was quite interested, when I went to university I studied communication with a specialization in the audiovisual. In the audiovisual area, I already began to focus on production. While I definitely wanted to work in cinema, I preferred to stay behind the scenes, thus in production. You have never been interested in actually being a filmmaker? No, I have never been interested in being a filmmaker or doing any of the artistic aspects. I have always been interested in the area of financing, organization, and the structure around the production. I like the idea of being at the head of the production line. Did you study cinema production management as part of your course work? No I did not; actually, there were no formal courses in which one could specialize directly. It took personal motivation and then, of course, the interest in wanting to focus on this aspect. For instance, during my studies, each time that I could pursue a subject or theme individually, I would work on the financial aspects of production, while my colleagues would focus on a certain filmmaker, and so on. The majority of the colleagues in my class became journalists. Out of thirty students, only two of us went in the direction of cinema. I went in the direction of film production, and another colleague is a camera operator for FR3 [a French television station]. After your studies, how did you evolve into cinema in general and cinema production in particular? I went to the theater five or so times a week. I had many subscriptions to film journals and I read everything concerning cinema. Gradually, I met people who in turn introduced me to others. Eventually I found myself on the inside. As a producer, could you talk about your profession, and what you do? The work of a producer consists of going from a project, an idea, and finding the means to materialize it. To materialize an idea, unfortunately, costs a great deal of money. That is, in summary, what I do. Do you produce mostly African films? Actually no, for a long time I worked in a French production company where we made documentaries. I have a passion for documentary films, and I am interested in this genre in general. For a long time, I have wanted to work in African cinema, on African film projects. I have lived a great deal of time outside of Africa and, since I do not live on the continent, I feel that to work on a project about Africa provides me with a connection with Africa. The most direct way to have this connection is to work on a film project that takes place in Africa, which gives me the impression of living with Africa. Have you had the opportunity to be the producer for an African film yet? Yes, for the first time I had the opportunity to be chosen as executive producer of an African film by Cheick Oumar Sissoko of Mali. I was doubly proud. First, because I would be working on an African film and, secondly, in my opinion Cheick Oumar Sissoko is the best. We have completed the shooting of Genesis and are beginning post-production. It has gone well so far because Sissoko is very good; he is a real artist, and so we speak the same language. Could you talk a bit about Genesis and the post-production process? I am now organizing the people and materials needed, which include a technician, editor, mixer, and others who will participate, as well as finding editing and mixing facilities. In addition, I must negotiate prices. Because the costs are very high and it is rare that payments can be made entirely up front, there is always the role of negotiating installment payments. How did you and Cheick Oumar Sissoko come together in a director/producer relationship? I was looking for work, he was looking for someone to organize his production, and I was available. Since we all know each other or about each other in this area—we knew each other as colleagues, we knew who was who—we both agreed. I, of course, read the script, and then we discussed how the production would be organized and what was necessary to bring it to fruition. You are located in Paris and Sissoko is in Mali—is the distance an impediment to the process? We communicate a great deal by telephone and fax, but also he passes through Europe quite often. Of course, it would be much easier if we were in the same place. Do you have your own company? Actually no, I am executive producer and I work independently, in a free-lance context. Companies call me to work on a particular project and when it is over I go to the next one. In terms of the production of African films, do you think that African filmmakers find it especially difficult to find a producer? Is there a lack of producers who are interested in African films? No, there is not a lack; in fact, I think that a good idea always finds a producer. Of course, I am exaggerating somewhat. There are many great ideas that, unfortunately, never see the light of day. However, it is as difficult for an African filmmaker debuting in cinema to find a producer as it is for any other artist in the world. Because a producer is someone who, above all, believes in your idea. It is not just any idea, but one that is of interest to the producer. It is also the filmmaker as a human being that interests the producer. To be able to combine both is not always easy. A producer is not a machine; an artist is not a machine. It must be understood that to make a film takes a minimum of two years; it can take five years. Therefore, for two years, five years, we will be together. We work together in difficult conditions. We do not know if the film is going to be made, there is no money. We really have to be motivated and supportive of each other. If there is a certain compassion and sympathy in the relationship, the work will be easy. You can have one of the most magnificent projects in the world, that is also well-financed, but if I find that on the human level we do not have the same values I will never work with you. Someone who comes with an idea wants me to find five million, ten million francs to produce it. There is a great deal of ambition on the part of the artist and a great deal of megalomania on the part of the producer to imagine that from an idea she or he will find five million francs; and this is a minimum. Of course, if you are talking about an American film we are talking about millions and millions. On the one hand, there is a certain "absurdness" that goes with this work, and this excitement or extravagance must be managed efficiently. There is a great deal of money that is at stake and everyone is expecting to get something out of it. It takes a special kind of profession to imagine that "your vision" of the world is worth all these millions! What role do you play once the film has been produced? Do you have any connections with the distribution and exhibition of the film that you produce? First of all, there is a difference between the production of the fiction film and the documentary. When I worked on documentaries in France, it was handled in a certain way. For instance, either you were an "heir to Ford"—where you could finance your own film—or you had to go through several stages. For example, there must be a television company that is connected to your project and interested in financing it, after which you may get funding from other state institutions, such as the Centre National du Cinéma. Of course, I am simplifying the process. Your film is then contracted to be broadcast by the television company. It is the television company that finances the funding of the film production. In this case, distribution becomes less of a problem. Of course, it is up to the producer to find other companies around the world if you want to reach a larger audience. On the other hand, the fiction film is more difficult. Financing through a television company only is not sufficient because the cost is often much higher, and the television company cannot assume the cost alone. Then you will still need to find a movie distributor, and that is also difficult. There are many films that are financed but are never screened in the cinema houses. For example, in France there are some two hundred films that are made each year with a lot of state funding, and there are perhaps only eighty percent of them that are actually shown. Imagine all the people involved in making the film: the producer, the filmmaker, and others who have participated for some time. The family has suffered, and then no one sees it! It is dramatic, but, in fact, it happens often. Would you say that it occurs twice as much with African films? Yes, I would say twice as much, but not because they are African films. I do not think that African films are censored. If one can define African films, I would say that they are viewed as art films. Moreover, art films throughout the world have difficulty finding producers. Because quite simply, they do not bring in much money. And this is the case, whether it is a French filmmaker who does not enter in commercial cinema, as we know it, or any other filmmaker across the globe. Even within independent cinema in the United States, filmmakers are in the same situation, although it is America with all the film networks. I think it is a false problem to say that African films are treated differently because they are African films. All films that are different have a limited audience. What do you see as the future of African cinema? A cinema cannot exist without the support of the state. So much is determined by it; financial support, for example, and there is a whole legislative structure that must be established. It is not the filmmaker or even FEPACI (Pan-African Federation of Filmmakers) that can do it. It must be the state that takes the lead. And for the moment, African states have no interest at all in this area, or in culture in general. I can even say that there is no interest in anything that has nothing to do with weapons or defense. As long as African governments do not take culture as a right, as a basic element that is essential, as important as any other domain, our cinema will always be nonexistent. Every cinema in the world—except the United States, which exports its cinema and is doing quite well—the cinema in all the European countries, apart from France, is almost dead. France has been able to preserve a cinema because the state is involved on a daily basis, on all levels. It supports a national cinema; it is an example. Our countries do not do this because, first, culture is not a priority for our governments and, secondly, even if they were financially motivated, they do not understand that cinema is also a source of revenue. For Americans, for instance, U.S. cinema exports rank second in foreign revenues. Support of African cinema does not exist in Africa. Therefore we are obliged to look to the outside for funding. The majority of the funding of African films comes from Europe, from foundations such as the Ministry of Cooperation. While it comes from outside of Africa, it is very generous on their part, because otherwise African films would not exist. It is rather troubling to realize that without outside support our cinema would be zero, it would not exist. Not because there are no artists—there are many—but because we do not provide the means. There are a few countries in Africa—I know the francophone countries better—that attempt to do something, notably Burkina Faso. We must pay homage to them, we are very thankful. Burkina Faso is a country that is not financially wealthy, but it has given culture the importance it deserves in everyday life. It has done a great deal for cinema and for African cinema in general. There have been many inter-African co-productions initiated by Burkina Faso. Each time that assistance is asked of the state of Burkina Faso, support is given. En guise d'hommage à Chantal Bagilishya, décédée le 28 septembre 2009, cet entretien réalisé en 1997 et 1998 par Beti Ellerson. Chantal, peux-tu raconter comment tu es entrée dans le domaine de l’image ? Est-ce qu’enfant ou adolescente tu rêvais de cinéma ? Personne dans ma famille ne travaillait dans ce milieu. C’était juste un rêve. Et, comme tous les rêves, on ne sait pas trop s’il va se réaliser. Il se trouve que le mien s’est réalisé et j’en suis heureuse. J’ai réalisé vers l’âge de 10 ans, en voyant mes premières images, que c’était un milieu qui m’attirait beaucoup. J’étais vraiment fascinée de voir la télé pour la première fois et je me demandais comment il était possible que des choses comme ça puissent exister. Qu’il y ait les gens derrière une image et puis voilà ! Après, je ne sais ce qui s’est passé, je n’ai pas décidé de travailler immédiatement dans l’audiovisuel mais j’y suis trente ans plus tard ! Quelle a été ta démarche ? Est-ce que tu avais des amis dans le cinéma ou as-tu pu travailler avec un cinéaste ? Non, pas du tout. C’était un milieu qui m’intéressait, donc après, quand j’ai été en faculté, j’ai suivi une formation en communication où il y avait une section audiovisuelle dans laquelle je m’intéressais déjà aux problèmes de production. Je voulais travailler dans le domaine des images mais dans les coulisses. Donc tu savais d’emblée que tu ne voulais pas devenir cinéaste ? je rigole bien sûr ! (rire). Quel genre de formation peut-on faire pour se préparer au métier de producteur ? Il n’y a rien qui t’amène à la production sinon une motivation personnelle. Et après par intérêt. Par exemple à la faculté, chaque fois qu’il fallait faire un travail personnel, des mémoires, des thèses, je le faisais sur les structures financières, pendant que les autres travaillaient sur tel cinéaste. Tu travaillais quand même dans un contexte cinématographique ? À l’école ? Non pas du tout. Mes camarades de promotion voulaient être journaliste et d’ailleurs ils le sont devenus. Sur trente personnes, on était deux à vouloir faire du cinéma, j’ai fait de la production et le copain est devenu cameraman. Comment t’es-tu informée sur les divers métiers du cinéma ? Chaque fois que tu t’intéresses à quelque chose tu t’y mets ! Je voulais travailler dans ce milieu et voilà ! J’allais souvent au cinéma, cinq fois par semaine, mais sans savoir que je voulais travailler dedans. J’étais abonnée à beaucoup de revues de cinéma. Je lisais tout ce qui concernait le cinéma et forcément, petit à petit, je rencontrais des gens qui m’en faisaient rencontrer d’autres. Et puis, plus tard, tu te trouves en train de galérer dans le cinéma et tu te dis « mon Dieu, peut-être que je n’aurais pas dû faire ça ! » (rire). Est-ce que tu peux parler de toi en tant que productrice ? Qu’est-ce que tu fais ? Comment ça se passe ? Le métier de producteur consiste à partir d’un projet, à partir d’une idée et à trouver le moyen de la matérialiser, ce qui malheureusement coûte beaucoup d’argent ! Pendant longtemps j’ai travaillé dans une société française où l’on faisait des documentaires. Je suis passionnée par les documentaires, je suis intéressée par le réel d’une façon générale. J’avais aussi beaucoup envie de travailler sur des films africains. Il se trouve que j’ai beaucoup vécu en dehors de l’Afrique et travailler sur des projets africains était un lien que je voulais conserver avec l’Afrique. Et pour la première fois, j’ai eu l’opportunité d’être choisie pour la production exécutive d’un film africain. C’était La Genèse, un film de Cheick Oumar Sissoko du Mali. J’étais doublement fière : premièrement, je voulais travailler sur un film africain et, deuxièmement, Cheick Oumar Sissoko était pour moi le meilleur cinéaste qui soit. Et le fait qu’il m’ait choisie c’était « le Pérou » pour moi ! Nous avons fini le tournage de La Genèse et nous allons commencer sa postproduction. Ça s’est bien passé parce que Sissoko est un vrai créateur et donc on parle le même langage. Est-ce que tu peux parler un peu de ce qui suit le tournage ? Maintenant que le tournage de La Genèse est terminé, on rentre dans la phase de postproduction et on cherche à trouver les moyens humains et matériels nécessaires. Il a fallu trouver les bons techniciens, le bon monteur, le bon mixeur et tous les gens qui vont participer à cette phase-là. Il faut aussi trouver les bonnes structures : la salle de montage, l’auditorium de mixage, etc., et cela aux tarifs les plus intéressants. Il faut négocier les prix car forcement tout ça coûte cher. Il est rare que les gens aient les moyens de payer tout de suite, alors il faut essayer de négocier de façon à ce que les paiements soient échelonnés. C’est ça qui nous préoccupe en ce moment. Les techniciens sont déjà trouvés et parallèlement nous sommes en train de finaliser la structure de postproduction au niveau du montage et du mixage. Est-ce que tu peux raconter comment tu en es venue à participer à la production de La Genèse de Cheick Oumar Sissoko ? Je cherchais du travail et il cherchait quelqu’un qui puisse organiser sa production. On se connaît tous dans le milieu, mais lui et moi n’avions jamais travaillé ensemble. On ne peut pas dire qu’on était copains, plutôt collègues. On savait qui était qui, mais on ne s’était jamais parlé. C’était une belle rencontre qui m’a conduite à lire le scénario du film. On ne m’avait pas sollicitée pour parler artistiquement du projet car Sissoko le fait très bien et il n’a pas besoin de moi. On m’a approchée pour essayer de voir comment les choses pouvaient s’organiser et quels moyens seraient nécessaires pour mener à bout ce projet. Comment ça se passe, toi à Paris, lui au Mali ? On communique beaucoup par téléphone et fax et puis il vient aussi en Europe régulièrement. C’est sûr que ça serait plus facile si on était au même endroit, mais c’est comme ça ! Est-ce que tu as ta propre compagnie ? Non je suis productrice exécutive. Je ne suis pas permanente, je suis free-lance. Ce sont les sociétés qui m’appellent pour travailler sur un projet et après je pars et je vais travailler ailleurs. Penses-tu que les réalisateurs africains aient plus de difficultés à trouver un producteur que les autres ? Y a-t-il un manque de producteurs intéressés par les films africains ? Non ça ne manque pas. En fait, j’imagine qu’une bonne idée trouve, presque toujours, un producteur. Disons qu’il est aussi difficile pour un jeune réalisateur africain de trouver un producteur que pour n’importe quel autre créateur dans le monde. Un producteur, c’est quelqu’un qui croit à ton idée. Ce n’est pas juste une idée, mais c’est une idée qui l’intéresse. Et c’est aussi toi en tant qu’être humain qui l’intéresse. Donc arriver à concilier les deux n’est pas évident. Un producteur n’est pas une machine, un créateur n’est pas une machine. Il faut savoir que faire un film prend au minimum deux ans, même cinq ans. Pendant deux ou cinq ans, le producteur et le réalisateur sont ensemble dans des conditions difficiles. On ne sait pas si le film va se faire. Souvent on n’a pas d’argent. Il faut vraiment qu’on soit motivé et qu’humainement on soit ensemble. Moi, ce qui m’intéresse avant tout chez quelqu’un, c’est l’humain. Si humainement on peut travailler ensemble je me dis que le travail sera facile. Tu peux arriver avec un projet magnifique et presque entièrement financé mais si je trouve qu’on n’a pas les mêmes valeurs, je ne travaillerai jamais avec toi. Il faut savoir que quelqu’un vient te voir en disant « tiens j’ai une idée ». Et, sur la base de cette idée, il veut qu’on lui trouve cinq ou dix millions pour le produire. Il y a donc beaucoup de prétention de la part de l’auteur et aussi une grande part de mégalomanie de la part du producteur, une grande part de folie aussi qui consiste à dire qu’à partir d’une idée, il va trouver cinq millions, ce qui est un minimum. Je ne parle pas des films américains où l’on parle de millions et de millions. Il y a une folie des deux côtés et cette folie doit se gérer parce que le projet met en cause beaucoup d’argent et que chacun doit s’y retrouver. Quel est ton rôle après la production du film, par exemple, en ce qui concerne la distribution et la vente du film ? Tout d’abord, il y a une différence entre la production d’un film de fiction et celle d’un documentaire. J’ai travaillé sur des documentaires en France où il y a une organisation assez particulière. Soit tu es « une héritière de Ford », auquel cas tu finances toi-même tes films, soit tu dois passer par plusieurs étapes. Il faut donc avoir une chaîne de télévision qui s’associe à ton projet. Une fois que tu as la chaîne de télévision et un peu d’argent, tu peux avoir d’autres bailleurs de fonds gouvernementaux, comme le Centre National du Cinéma. Bien sûr, je simplifie le processus. À partir de ce moment, la chaîne s’engage à diffuser ton film et te donne l’argent pour le faire. Dans ce cas, la distribution devient moins problématique bien sûr. Mais en tant que producteur, tu as envie de trouver d’autres chaînes, partout dans le monde, pour atteindre un public plus large. Pour une fiction, c’est plus difficile. Le financement d’une chaîne de télévision n’est pas suffisant car le coût est souvent très élevé et la chaîne ne peut l’assumer toute seule. Il faut donc trouver un distributeur et c’est très difficile. Il y a beaucoup de films qui sont financés mais ne sortent jamais. Par exemple, en France, il y a quelque deux cents films qui sont produits chaque année avec beaucoup d’argent provenant de l’État mais il n’y a peut-être que quatre-vingts pour cent d’entre eux qui sortent. Imaginez toutes les personnes impliquées dans la réalisation du film : le producteur, le réalisateur et d’autres qui y ont participé pendant un certain temps. La famille a souffert et personne ne le voit ! C’est dramatique mais, il y en a beaucoup dans ce cas ! Dirais-tu que c’est doublement le cas pour les films africains ? Oui, c’est doublement le cas mais pas parce que ce sont des films africains. Je ne pense pas qu’ils soient censurés. Ce sont des films d’auteur et les films d’auteur du monde entier trouvent difficilement des distributeurs parce qu’ils ne rapportent pas beaucoup d’argent. C’est vrai pour un auteur français qui ne s’inscrit pas dans le cinéma commercial, comme pour tout autre auteur. Même le cinéma indépendant américain connaît le même problème et cela bien que l’Amérique soit La Mecque du cinéma ! Je pense que c’est un faux problème de dire que les films africains sont censurés. Tout film qui est différent trouve difficilement son public ou du moins son public est restreint. Comment vois-tu l’avenir du cinéma africain ? En général, le cinéma ne peut exister sans le soutien de l’État parce qu’il met en cause beaucoup de choses et donc, beaucoup d’argent. Il y a tout un cadre législatif qu’il faut mettre en place. Ce n’est pas le cinéaste, voire la FEPACI (Fédération panafricaine des cinéastes), qui peut le faire. C’est un domaine que doit conserver l’État mais, pour l’instant, nos États s’en désintéressent complètement comme ils se désintéressent d’une façon générale de la culture. Je peux même dire qu’ils ne montrent aucun intérêt à tout ce qui n’a rien à voir avec les armes ou la défense. Tant que nos États, les gouvernements africains, ne considèrent pas la culture comme étant aussi importante que d’autres domaines, notre cinéma sera toujours inexistant. Aux États-Unis, un pays qui exporte son cinéma, le cinéma se porte plutôt bien, mais dans tous les pays européens, en dehors de la France, il est presque mort. La France arrive à conserver un cinéma parce que l’État y est impliqué au quotidien. Il soutient son cinéma national, par plusieurs mécanismes… c’est vraiment un exemple. Nos pays ne font pas cela parce que, d’une part, la culture n’est pas une priorité pour nos gouvernements et, d’autre part, même s’ils sont financièrement motivés, ils ne comprennent pas que le cinéma est aussi une source de revenus. Les Américains savent très bien que leur cinéma est la deuxième source de devises à l’exportation. Le soutien du cinéma africain n’existe pas en Afrique, c’est pourquoi nous sommes obligés de chercher des sources de financement à l’extérieur. La plupart des financements des films africains viennent d’Europe, d’Agences gouvernementales comme le Ministère de la Coopération. C’est très généreux de leur part parce qu’autrement les films africains n’existeraient pas. Il est assez troublant de réaliser que sans appui extérieur, notre cinéma n’existerait pas. Non pas parce qu’il n’y a pas de créateur : il y en a beaucoup, mais parce qu’on ne leur donne aucun moyen. Il y a quelques pays en Afrique – je connais mieux les pays francophones -, qui essayent de faire des choses, notamment le Burkina Faso. On leur rend hommage, on n’est jamais assez reconnaissant. C’est un pays qui n’a pas beaucoup de moyens mais il a donné à la culture la place qu’elle mérite dans la vie de tous les jours. Il fait beaucoup pour le cinéma et pour le cinéma africain en particulier. Il y a eu de nombreuses coproductions interafricaines initiées par le Burkina Faso. Chaque fois que quelqu’un demande une aide au Burkina, cette personne est aidée dans la mesure du possible. C’est toujours pareil, c’est une question de langue, c’est l’héritage de la colonisation. Les rapports entre nous ne sont pas très étroits parce qu’on n’arrive pas à communiquer, d’abord de par la langue et deuxièmement parce que le voyage interafricain est plus compliqué et plus cher qu’en passant par l’Europe. Il y a beaucoup de choses qui rendent la communication difficile. Si on veut communiquer, il faut qu’on réfléchisse à d’autres façons de communiquer. La communication est très difficile, non pas parce qu’on a des visions différentes mais parce qu’on a des langues différentes. Dans la cellule de réflexion que les femmes sont en train de faire, il y a des femmes du Kenya, du Ghana et aussi des femmes francophones : moi, des Burkinabés et d’autres. Nous avons toute la bonne volonté du monde pour essayer de communiquer mais c’est difficile, et ça fait mal. Et tant qu’on ne parle pas des problèmes on ne peut pas les résoudre. On continue de vivre le mythe d’une Afrique unie, de Noirs qui sont frères. Il y a beaucoup d’obstacles et ça serait bien d’en parler, quitte à ce qu’on se batte en en parlant. Ce n’est pas normal qu’au moment où tout le monde a tendance à s’élargir nous n’arrivions pas à travailler ensemble. L’Union Européenne a pris du temps mais elle existe. On doit travailler ensemble « by any means necessary » comme le disait Malcolm X. C’est ça la vie, il y a beaucoup de choses qui nous réunissent et il y a beaucoup de choses qui nous séparent. On doit parler de tout cela, on a tendance à ne pas le faire. 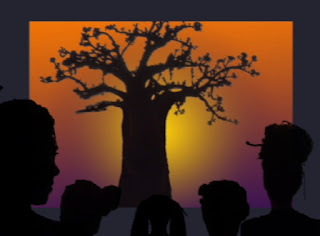 Here I expand on the 16 April 2009 post “Negotiating Racialized Identities in African Women’s Films” to explore how African women tease out their evolving identities in their work or develop the characters in their films as conduits for this process. Drawing from theories and approaches of Postcoloniality and Identity Studies I consider the multiple identities that women have as filmmakers and how these identities inform their work. Postcoloniality as a theoretical framework examines the social, political, cultural and economic context of former colonial subjects, locations, and structures. In so doing it disrupts and decenters the colonial-as-center paradigm. The Gaze of the “colonized” becomes the center of focus at the revisited site of colonialism. Identity is intricately linked to this project as deculturation and assimilation were important strategies of colonization. But perhaps the geo-politics of identities within a post-colonial and also post-modern context is what is most compelling as it is an intricate part of African women’s cinemas. Traveling, sojourning and relocating across the globe have required shifting or ultimately expanding their identity and thus, their cinema. Some women approach their filmmaking from the context of immigration, linking the identity of their cinema with her own identity, which may be "one and multiple, and sometimes fragmented." Some, who have lived a large part of their lives outside of Africa, embrace African-related film projects, thus providing them with a connection to Africa. Others, experiences many places that are very much part of their identity, not necessarily experiencing home in only one location and hence refuse to recognise designated geographical borders. They prefer to have the trans-African, cross-Diaspora situation play out powerfully in their work. Still others express the desire to go beyond ethnicity and race which risks racial essentialism. Using the lens as a vehicle to show their vision of the world, many African women transcend geographies, their imaginaire informed by the evolving identities that go beyond these boundaries as well. And thus, these identities frame their cinematic narratives as they embrace evolving locations and experiences. Update in March 2018 excludes specific names with quotes, but rather reflects general experiences.